Streaming movies from mobile devices onto TVs isn’t as easy as it seems. Samsung hopes to make that easier with its new line of 4K Smart TVs, which have the brand-new Tizen operating system. Samsung has started shipping some of its new curved and flat-panel Smart TVs, and announced prices for other models that will ship in the coming months. The TVs, which start $949.99, come in ultra-high definition [3840 by 2160] resolutions. The user interface in the new Smart TVs will look different from TVs released in previous years. Samsung’s entire Smart TV line-up in 2015 is based on Tizen, which brings TVs closer to mobile devices and Internet-based streaming content, the company said. It’ll just take the press of one button for users to stream video from a smartphone or tablet to the TV. The feature will work with some Samsung smartphones and tablets, and users can continue using their mobile device as a movie streams to the TV. Content from a mobile device to TV will stream via Wi-Fi Direct, and Bluetooth wireless technology will be used for device discovery. Samsung has also said that the TVs—even when shut off—will be able to stream live broadcasts to mobile devices. Samsung limits these features only to its mobile devices, but not other brands, something it has been doing with its past entertainment products. With Tizen OS, Samsung has also introduced a new Smart Hub interface through which users get access to streaming and other content. New entertainment options and custom content options will be available from the opening screen, and the Tizen OS will make it easier to find content. Some TVs in the new lineup with the SUHD suffix have quantum dots technology, which helps produce sharper color and images. These models are also more expensive than the traditional LED TVs. Some models in this 2015 TV lineup are able to upscale high-definition content to 4K video. — JS9100 Curved SUHD: The 78-inch large-screen TV will ship in May for $9,999.99. — JS9500 Curved SUHD: The 65-inch TV will ship this month for $6499.99. 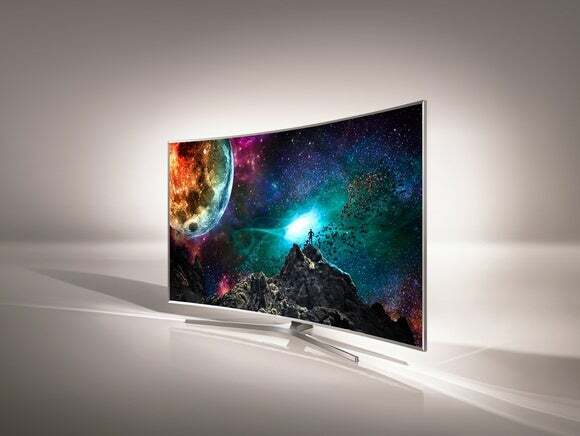 — JU6700 Curved UHD: A $949.99 40-inch model is the least expensive of all new Samsung TVs. A 65-inch model is $2,699.99, and will ship in the coming months. — JU7100 UHD—A 40-inch is now available for $1,399.99, and a 60-inch for $2,499.99. — JS8500 SUHD: A 40-inch model is shipping for $2,999.99 and a 50-inch model for $3,999.99.